Today I will be showing you how to build a basic proxy connection tool. In later articles I will be showing you how to automatically download and load proxies into our application from a range of websites but for now we will just work on getting our application to use proxies. This program was coded in Visual Studio 2010 however the same code should work in all versions from Visual Studio 2008 and after. 3. To have your buttons and status strip label look the same as mine (shown in screenshot below) simply change the following in the properties pane for each. This code will call the SetProxy sub which we will create in the next step. This code will also split the proxy IP and Port into two sections (IP & Port) and pass this to the SetProxy sub. 5. The next step is to create the SetProxy sub. Copy the following code and paste it below the btnConnect sub. This sub sets the information into the registry and also changes the colour and text of the status label. 6. We then need to add code to our disconnect button. To do this simply paste the following code into the disconnect button. This code will disconnect the user and change the registry & status label back to normal. lblStatus.Text = "Proxy Status: Disconnected"
8. 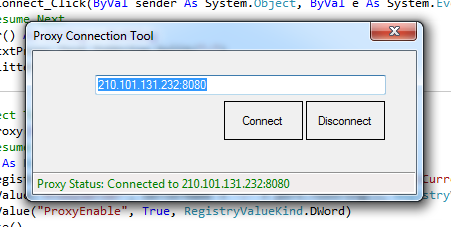 Now you should be able to run your application and enter a proxy (IP:Port) into the text box and connect to it using the connect button. Remember to disconnect from the proxy before closing the application as the application will not disconnect you on exit. 9. To check to make sure the application is working correctly, navigate to http://whatismyipaddress.com/ and see if your IP Address has changed.